"Friends, we need to have a little talk. Judging from some of your emails, many of you are Woefully Ignorant of one of the most important debates going on the world today. I refer to the fight between Flint-style coneys and Detroit-style coneys. Apparently there is a place claiming to be "Angelo's" located in shiny Ann Arbor (a yuppie Detroit suburb with delusions of grandeur) selling some vile mockery of a coney dog. I'm here to tell you that this is WRONG. Coneys belong to Flint. Flint invented coneys. Specifically, coneys belong to a little place called Angelo's." With room for nearly 35,000 students and fewer than 16,000 enrolled, the Flint School District is struggling to decide which schools will be closed. The best high school's in the Flint area are Hamady High School, Imlay City High School and International Academy of Flint, according to U.S. News & World Report. A building housing the new office for the Community Foundation of Greater Flint is expected to be done in April. Stores that were once home to Dale's Foods for Health and Baker Drugs are being combined into a multi-use building, with space for a restaurant or commercial use on the first floor, office space on the second floor and loft apartments on the top floor of the former Dale's building. After the Community Foundation moves to its new quarters at S. Saginaw and First streets, the Flint Convention & Visitors Bureau plans to move to the current Community Foundation building on Church Street. 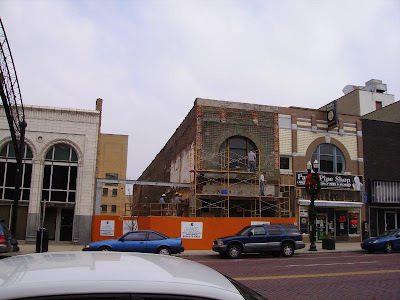 A new building for Wade Trim, also in the 500 block of S. Saginaw Street, is expected to be done in the summer. The engineering firm will have offices on the second floor, WNEM (Channel 5) will have a studio on the first floor, and other commercial space will be available. The Rowe building, across S. Saginaw Street, is expected to be complete after the Wade Trim building. The Rowe and Wade Trim buildings will follow the same development plan as the Community Foundation building, with commercial and/or restaurant space on the first floor, offices on the second floors -- and the third floor of the Rowe building -- and apartments on the top floors. The three projects are being done by Uptown Developments. The city of Flint and Downtown Development Authority are working on a new parking ramp, to be built at Kearsley and Beach streets. Construction is expected to begin in May. Poet and musician Larry O. Dean was born and raised in Flint, where he worked with Michael Moore as an arts editor and reporter at The Flint Voice. He's the author of seven books, including I Am Spam, a series of poems inspired by spam email. Here's an excerpt from his poem entitled "Are You An Artist? Find out Free:"
that badly? Does it even matter? You're either an artist, or you're not. 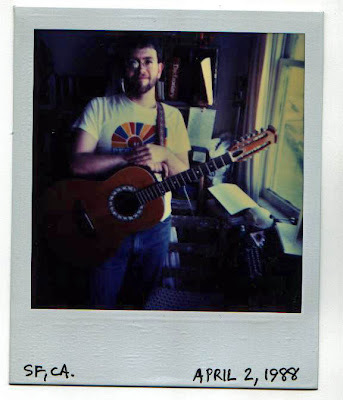 After living in San Francisco, he now teaches poetry in the Chicago Public Schools, gives frequent readings, and is a singer-songwriter, working both solo as well as with several pop bands, including Post Office, The Me Decade, and currently, The Injured Parties. The editor of the The Michigan Times, UM-Flint's student newspaper, has been pushed aside, sort of, for printing a letter to the editor that insulted Muslims. The move comes as the Flint campus ushers in a new journalism degree program. 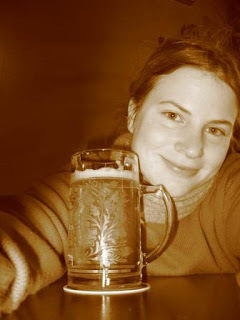 "Student Amanda Durish, who defended running the letter in September and refused Lewis' suggestion to step down as The Times' three-year editor-in-chief, graduates this year. Durish has become "editor emeritus" and Mike Stechschulte will become editor in chief next semester. Durish and administrators say the changes are not because of the letter controversy." Durish just might be the first person in her twenties to earn the "emeritus" title after her name. It makes you wonder what the journalism students will be learning about freedom of the press. Flint's housing situation seems relatively straight forward. The population has dipped, creating a lot of empty houses. The Land Bank has stepped in to rehab or remove the most dilapidated eyesores, but there are so many empty homes it's hard to keep up. "The Grand Traverse District Neighborhood Association Secretary Steve Snuske reported he met with two representatives from Habitat for Humanity to discuss infill housing in the neighborhood. They were referred by the Ruth Mott Foundation and may build 12 to 14 owner-occupied houses over a period of three years. The houses would be designed and built to look like surrounding homes and appear as if “they are a part of and always were in the neighborhood.” Snuske said there are not yet any plans to move forward with the project." Things get a lot more complicated when you start trying to decide which neighborhoods will get more housing, and which will simply be dotted with vacant lots or disappear altogether. One of the many good things the Genesse County Land Bank does is help Flint residents improve vacant lots and and take part in the urban farming movement, which is just a fancy way of describing people in cities who have gardens. "The Land Bank's Clean and Green Program started as a pilot project during the summer of 2003 in which two community groups partnered in the maintenance of 45 Land Bank owned properties on Flint’s east side. Of these 45 properties, 10 were improved with decorative split rail fencing and raised garden beds. During the summer of 2006 twelve community groups participated in the program. These groups maintained over 600 Land Bank properties and developed 12 greening projects. In conjunction with Keep Genesse County Beautiful’s Beautification awards ceremony, the Land Bank recognized participating groups and awards were presented to the groups with the most outstanding greening projects." One impressive example is the demonstration garden at 310 W. Home Avenue, pictured above. It was designed by master gardener Phil Downs and nurtured by a band of residents and volunteers. As Flint Expatriates has already mentioned, these efforts are catching the attention of the national media. For more information on local gardening in Flint, check out the MCC Gardening Association, the Flint Urban Gardening and Land Use Committee, and the Backyard Herbalist. Interested in seeing what downtown Flint looks like now? There are loads of photos available at skyscraper.com, including this one of construction taking place next to Paul's Pipe Shop. Anyone remember when you could buy Detroit Tiger tickets there? Besides Balkan Bakery, it's probably the best smelling business in Flint. Flint is apparently operating without a valid city budget. Maybe. Well, it really depends on who you talk to about it. Regardless of who's right — the mayor or the city council — the dispute could cost Flint a $1.6 million state grant to convert the confusing one-way streets downtown into more convenient two-way thoroughfares. I was never a huge fan of The Flint Journal when I was growing up. When I wrote a research paper in grad school on the Journal's coverage of the Flint Sit-Down Strike, I was ashamed to discover the hometown rag wasn't just boring, it had a long history of carrying water for GM. Great newspapers don't toady up to the most powerful business in town. They do just the opposite. "Flint, do you know where your Don is? Honest to gosh, where's he been? I see his campaign signs everywhere, so I know he's out there, but other than that, you'd hardly know an election was nigh. This last month is supposed to be the silly season. Where's the Don's customary announcement of some bizarro project that will turn Flint around -- like, say, turning Genesee Towers into the world's biggest haunted house or making the former Forest Park into a hunting preserve?" And he seems to elicit some very entertaining responses to his work from the public, like this recent missive from Thorgrimm44 reflecting on Williamson's reelection. "All I know is the sooner I can get out of this nutty town the better. I hate it here. There is no reason to stay and putting this nut back in office is just another example of how low the IQ in this town has gone...You are also correct in saying its going to be a wild ride. God help this city if that goofball gets to re-write the city charter. Next the money will read...in Don we trust...I could go on but I have packing to do." Yes, we have a bad image. But it's not an undeserved image. To the contrary, it's very deserved, through little fault of our own. Flint is ground zero. A nuclear bomb of economic change landed smack upon our formerly fair city. Manufacturing jobs, as they have all over the country, were vaporized in the blast. Nothing new has replaced them. As a result, we lead the league in a whole host of social ills. Poverty, drug use, crime, obesity, joblessness. You name it. What's worse is there's little we can do about many of our troubles. Move Toyota or Honda in here, sure, we'd improve quickly. Poverty would drop, crime would fall and so on. But that's not bloody likely to happen, now is it? Good people don't want to hear it, and smart people should never believe it, but it's true: Our problems aren't going away. Barring a miracle, the Flint you have now is largely the Flint you'll have five years from now. 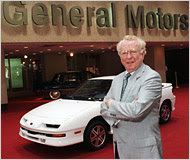 Roger Smith, the former head of GM and Michael Moore's quarry in Roger & Me, has died at the age of 82 in suburban Detroit. “Roger Smith’s tenure was one of the darkest in General Motors’ history, for customers, workers and for residents of G.M.’s factory towns,” the consumer advocate Ralph Nader said in 1995.